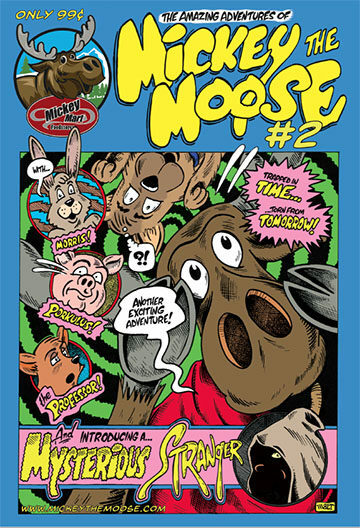 MICKEY MART FOLLOWS HIT MOOSE COMIC BOOK WITH MICKEY THE MOOSE #2! Milan, Ohio – March 3, 2017 – Mickey Mart Foodstores strikes again with the release of the second issue of their successful comic book, “The Adventures of Mickey the Moose.” The follow up to the popular first issue will be available in all Mickey Mart Foodstore locations on March 9, 2017. As with issue 1, The Amazing Adventures of Mickey the Moose #2 includes puzzles, games, jokes, photos and letters from young readers, and sells for a mere 99 cents! Mickey is proud that this is the best value in comic books. Fans love the Moose Comic Book! The 24-page comic finds Mickey and his friends traveling through time. Along the way they are tormented by an Evil Robot Moose and a Mysterious Hooded Stranger. New friends feature a stand-up comedian porcupine and a pair of masked wrestling squirrels. You read that correctly. Mickey and his friends try to keep history from being changed by doing things such as helping build Ohio’s first roller coaster and winning the Battle of Lake Erie. Throughout the story there are many surprises and special visits from famous Ohio personalities from history. The comic book is designed for younger readers but will also be enjoyed by adults. Mickey Mart didn’t want to create an ordinary comic story for their mascot, Mickey the Moose. In addition to entertaining people they wanted to use the comic to teach readers fun things about some of the people and places which make Ohio so special. Only 2000 copies of this collectible comic book are in print, so they won’t last long. The comic is available at all Mickey Mart Foodstore locations. A complete list of store locations can be found at www.mickeythemoose.com. Love Moose Comic #2? Click Here to get every Mickey the Moose Comic!